PLO tournaments (Omaha Hi Version) are becoming increasingly popular. Their fast paced, high action nature attracts many ‘gamblers’, or maniacs, but also savvy players looking to exploit the loose money. Because early stages of a Pot Limit Omaha tournament are often a ‘crapshoot’, with five or six players frequently entering big pots and committing their entire stacks, they are usually in a re-buy format. This allows skillful players to possess some control over the short term variance in the game. Pot Limit Omaha Tournament Strategy can be divided into three sections – the early, middle, and latter stages. 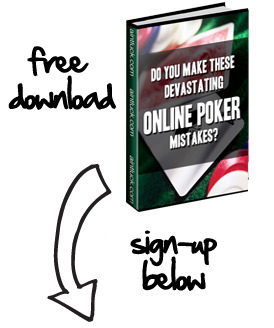 • As already mentioned, the early stages of a PLO tournament, particularly re-buys, are often crapshoots. It’s about survival, and picking your spots. Unlike NL Hold’em, there are likely to be several novices at lower buyins, who either have no comprehension of the ‘two from the hand, three from the board’ concept, or simply have no grasp of a good starting hand. The key to the start of a PLO tournament is vigilance. Look out for the weak players who can’t lay down AAxx on a flush or straight board, or chase non-nut redraws. • Identify the re-buy happy gamblers / maniacs and exploit them, and remember that position is fundamental. Never open with marginal hands in early position, because in a re-buy format, there’s a good chance you are going to induce two or three pot sized raises ahead of you. You should be able to accumulate quite a significant stack from these players, by playing premium hands such as suited Ace high hands, and high wraps. • There is another philosophy that can be adopted, but you need a lot of confidence in your ability to reclaim your opponents’ chips. This involves being very aggressive, playing more marginal hands, and being prepared to re-buy several times in order to accumulate a big stack early on. This obviously gives you more comfort in the middle stages of the tournament. You should only adopt this strategy, however, if you believe you have a serious edge over the opponents at your table. Also, note the ‘breaking time’ of the table – i.e. when players can be switched – otherwise you can be relinquishing your chips without the opportunity to reclaim them. • As blinds steepen, your post-flop options become more limited, so your reads on players become all the more important. There are fewer opportunities to bluff, float, and in general, practice ‘trickier’ plays. • PLO hands are a lot closer in starting value, so you will be rarely be a huge favorite before the flop. Hands such as AAKK double suited and high, double suited wraps such as 910JQ are the kind of premium hands you should be looking to move all in with pre-flop. • We alluded to the importance of ‘reads’, but what should we be looking for? Obviously we need to observe the maniacs / weaker players who overplay marginal hands, but it is unlikely that a whole host of weaker players have survived. Consider the raising range of players that open pots – do they only raise with pocket aces / kings? If you call with a low wrap and hit the flop well, and your opponent makes a pot size continuation, you could seize a big pot. Perhaps look to play back at players who abuse their position by constantly raising on the button. Also, look to exploit passive players, who perhaps only bet with a ‘made hand’, such as two pair, on the flop. If a scare card comes on the turn, which completes a straight or flush, these players may easily fold to any kind of aggression. You have to remember that PLO is a high variance game, and there are going to be plenty of times where you experience a cooler or bust out with the best hand. Just concentrate on making the correct decisions, and punish players who draw to the non-nuts. Be sure to make notes on betting patters and other individual tendencies, and use the HUD of your tracking software if you have it at your disposal to help you assess respective ranges. • Your aim should always be to make the final-table, and then win the tournament. Scraping to the bubble will usually only double your buy-in – hardly profitable for potentially hours of play. You should be looking to maintain your aggression, and exploit the ‘dead money’ – i.e. the players just trying to squeeze into the money. These players will usually be short-stacked, and playing ultra-tight, so when in on the button and in position, look to throw several pot-size bets in, even with air, as your fold-equity is so great. Even if they do catch a hand, it won’t inflict such a significant dent on your stack. • Playing the final table involves a culmination of all the strategies discussed in the three stages. You should employ controlled aggression, and don’t just look to slip up a single money place, as blinds will inevitably swallow you up and your options become severely limited. Again, you should be looking to exploit the ultra-tight players, who for them, the money obviously means a great deal, by being aggressive. This does not condone reckless play, however. If you are in a three way pot, and one player is all in, be wise and check it down – look to eliminate the player and move up a placement. Watch out for pre-flop and flop bets that commit more than half of your opponents chips – they should be deemed ‘all-ins’ as the opponent is clearly pot committed. Avoid playing marginal hands in these situations.